A quick edit in of basic stats from the post that had been in section 1: Shea has awoken and is plotting revenge. The city has hit cooler waters and a cooler climate and has anchored off the coast of a largish continent with rivers and tributaries where they will remain anchored for roughly a month to a month and a half. Plenty of time for trading and for the city's denizens to get some much needed vacation time in. Jermayan noticed quickly when the weather began to turn. There was a hint of cold on the wind. The waters clarity changed almost overnight. He didn’t require a jacket as of yet, but he had taken to wearing a knitted sweater when he worked on the docks or was idly fishing. He even found time to build his strength by swimming in the carefully guarded pools meant for such pursuits. He had been bringing home fish while Shea was laid up and still recovering from the slime poisoning. He had made a variety of dishes that called for fish. At first, he was making fish stews and carefully brewing teas. As Shea recovered, the stew lightened to soup. Eventually he was making dishes to build her strength and stamina back up. He went to the market to find the right vegetables and spices to help her as much as he could. When the floating city came to a halt, he frowned and went to find out what was going on. There was no way he could understand what the halt meant. He asked Shea about it. There were things he could use on the mainland and he could trade some of his goods meant for that purpose. He waited patiently for her answer. He needed her help with the bartering and trading. He really hoped that he could find a smith who could do runic work. They were rare and even at home, finding a rune smith was no easy task. He would just have to hope they found someone. It was a tall order, but he knew they existed and that should make for interesting possibilities next time they were attacked by the fish people. He had no doubts that they were waiting for the right opportunity. He didn’t trust his own weapons if they had to fight again. For most creatures, his weapons were fine, but for the piranhaguin, he doubted they would hold up well. As for armor, he had boiled leather, but that wasn’t really, what he needed. It would help, but that was all. He needed real armor and protection. Perhaps he would find what he sought soon enough. Only time would tell on whether he could get what he needed or not. Shea was back to work teaching the children Martial Arts when the city came to a full stop. She'd expected it once they reached bluer waters since all the fishermen had been commenting how close they were to the next continent. She dismissed class early and contemplated on the last few days. Her wounds were completely healed. She really hadn't been given much choice really since every time she woke up she'd been stuffed full of food and sent back to bed to rest. But now she was up and she was determined to get even with him at some point for that initial drugging at the tea shop, which had led to many days of being stuffed and more sleep. 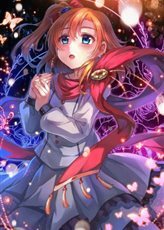 Her back was healed completely but the scarring was tender and she'd been informed by the healer that it would be for some time until the skin stretched to accomidate her full range of movement. Granted if it had been anything other than Slime Poisoning she wouldn't even have a scar; but it had been and so she did. The city coming to a stop was a multi-day event since something of this size took a little time to completely halt all movement. Instead of descending to the docks today she went up, up, up to the top of the wall. Grinding noises could be heard as the top of the wall opened outward and small boats, not the dingies down on the docks, perfectly suited to river travel rose upward. In all there were eight of these boats. Around them workers bustled, attaching the masts and pontoon stabalizers. Made for city to shore travel as well as traversing the rivers of this continent, these boats would soon be hauling both people as well as cargo to the small towns up and down the vast river systems. She soon was pitching in to get them ready to travel, all the time wondering exactly how they were going to be gotten down from here. Within the hour everything was attached that needed to be attached to these boats and with a great grinding noise the boats, all 8 of them, were taxied to the edge of the wall in their bays and then summarily dumped over the side. The ropes she herself had tied grew taut as the boats fell, pulling the boats upright so that when they landed, they landed upright with the masts rising high in the air. The crewmen of the boats slung themselves down the ropes to continue with the preperations and she watched as the bays retraced into the wall and it closed atop them. After all the commotion she headed back to her quarters and answered his questions. "Yes. We'll be going ashore. From what I understand we'll be here a couple of months since this is a major trade stop. I'd say bring at least half of the furs. Especially bring the Ivory since the first town we hit is going to be a port town. They'll sell good there. The gems we'll leave here. Between the furs and ivory you'll have a decent amount of platinum to work with. I'll be bringing some trade goods as well." She rummaged in her section of the safe, pulling out a small bag and opening it to reveal multi-colored scales. "Not all of the fish I catch is for eating. Well it all is. But certain fish have scales that are worth a lot of cash. They're harder than diamonds and even a stash this small is worth a decent fortune. I could have turned them into jewelry but they're actually worth more in this raw form. Besides being made into armor they are also used as betrothal gifts on this continent. There are only about 80 here but that's still plenty." Gesturing to the furs and Ivory, "grab it. Pack a bag that allows for a few days worth of travel. We'll be traveling from the port town to the largest city on the continent. If you can't find it there, blacksmith-wise, then it doesn't exist." She waited for him to grab his sellables before she shut and secured the safe, "we'll have plenty of time to travel. This continent is fairly high tech, at least as far as travely is concerned. From the main port town, where we'll make landfall, to the large city on this continent its a three day travel, from what I've been told. They have regular transports, one that picks up in the morning; that one is out. Another that picks up in the afternoon; again, out. So we'll be taking the evening transport. Its slower, most people are just going to wait until morning, but won't be crowded. Three days we'll watch the scenerie, enjoy being on land, see the sights as we pass them by. Then we'll spend a week in the big city. I haven't been there so we'll just have to play things by ear. But I'll make sure we don't get ripped off at least." That having been said, she closed up the picture and walked to her room to start packing. She was fast, though she did dart out into the kitchen to wrap up several bags of tea to bring with her before darting back into her room to continue her packing. The bag she packed sat upon her back, lightly. It was large but fit her well and served as a good travel bag. She flopped down onto the couch, easing her bag off of her back as she moved and giving a grimace from the motion and muttering to herself, "gonna grab me some balm while I'm there. Along with some aloe, mint, cocoa butter, and shea leaves. Need a couple new shirts and some shorts. A few more Gi's. Also need to find...," her voice went silent though it was still very obvious she was muttering to herself since her lips were moving. He packed as he was instructed to do so. He had already packed clothes and the necessities he would need. He had also packed tea and some non-perishable travel foods. He blinked at the scales and then frowned. Who would want to buy scales? Aloud he said something else. He also had his platinum from his previous transaction. He didn’t know if it was a lot or not, but it was more than most of his people made in a lifetime. He couldn’t fathom needing more than that to live for a long time. He didn’t complain about their departure time. They had a destination and a route as well as a means to get there. His trek out of the mountains had been perilous and it had taken months of hard travel to reach the port city. He doubted this technologically advanced place would be that bad. She said three days. He almost wondered if they could run there faster. He didn’t get an answer as she was muttering to herself about things she needed. He didn’t understand most of it. So he spent time making a list as well, though he figured they had three whole days to make a list of items they couldn’t live without having. His main list was for a blacksmith. Or was that rune smith? It hardly mattered. If one was to be found, she said it would be found there. He pushed it out of his mind, worrying about it would not help. He was dressed in his boiled leather armor, the cave bear fur around his shoulders like a cape. It was better than armor, but heavier than any armor he had found too. It would also double as a blanket. He left the rest of his fur armor behind. It wasn’t that cold and he doubted that he would need so much protection in a place like this. His axe slid easily over his shoulder in its harness. Then he added a few of the throwing axes just to be sure. He had little doubt that Shea was armed with her little knives. Very few fools would attempt to rob them on the road. Though Shea was tiny, she seemed to have a predatory demeanor. She was more animal than human from what he understood. That should work in their favor as well. He was waiting for Shea to finish whatever she was doing. When she finally ready he slung his large pack casually over one shoulder, leaving his weapon arm free and handed her a covered mug of tea. He had made the one that called to him in the shop. It was heavily spiced and very earthy in scent. It was a wonderful blend, especially for someone like Shea who would like the fortification from the cold. Overall, it was a wonderful tea. The one who blended it must be a grandmaster. He didn’t even add anything to his; it was truly a wonderful balance. Honey or other sweeteners would have ruined that delicate balance. He had a feeling it was meant to be enjoyed as is. The tea itself had reminded him to pack a supply of honey disks. Some of the teas needed the honey, but they were also a very good source of protein and nutrients they would need as it got colder. These were raw honey discs. They didn’t strain out the pollen and other things, just shaped it into disks and let it harden for ease of carrying. He smiled as they left, he was eager to see the city. He wondered what they would find on this stage of their journey. It was a new and exciting place. He just hoped they found everything they needed or wanted. Noticing that he was ready, Shea stood. Coming from a warm climate, she had little clothing for colder temperatures. In fact, save for the times she'd tried fishing up north she had stayed inside mostly except for when she gave her classes. Before ducking out the door she reached behind it to where her jacket was hanging and tugged it off. She'd put it on once they were on the boat if it was too cold for her. She draped it over her arm, accepted the cup of tea, and shut and locked the door behind her once he was out and in the hallway. She led the way out to the boats. It mattered little which boat they took since, initially, all were going to the same place. With a wave she hopped aboard, making a nice leap from dock to deck and ignoring the board that spanned between the two. She landed easily and walked over to a section of the deck to look out. A shout went up after the rest finished boarding, "Pull up the plank! Untie the moorings! Set sail!" Just that quickly the boat was thrust away from the dock with a shove from an oddly shaped stick and they were under way. She drank the tea, in fact was quite glad for it's warmth, and set the cup down once it was empty. One of the deck hands grinned at her and picked it up, "We'll hang onto this for ya Shea and get it back to ya when we're all back city-side." Grinning she nodded, "thanks Markel. Appreciate it," then returned her attention to the horizon and the port town growing ever closer. The boat docked and she was the first one off. Again she simply leaped from deck to dock nimbly. It was mid-day and she turned to Jermayan with a grin, "well get a good price for that Ivory here. These old men...they love to carve. Those large pieces will fetch a very decent price here for sure." 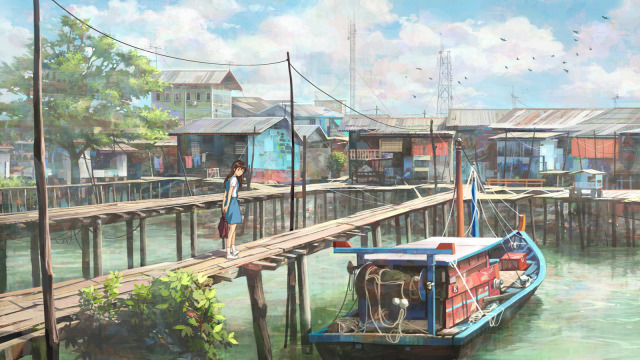 Looking around as she walked up the dock towards the town she laughed, "Land! Its so great!" She turned to her companion and smiled widely, fangs showing a bit, "we'll have some fun while here too!" The town wasn't large but it was prosperous and obviously so. The houses were, mostly, made of stone. A few were still made of wood but it was obvious that there had been some modernization in recent years. Many shops and street-side vendors were out and about. The weather was sunny, if quite chilly, and there was a slight dusting of snow on the ground. The people who lived there, who manned the shops, were much more animalistic in nature compared to most of the people coming from the city. Most had variant colored fur, faces that were a mix of animal and human, were taller than humans, and were very obviously stronger. These were not human hybrids. These were Evolved Animals. They appeared human-like but were much more feral and honest in their nature. Once off the dock and out of the way a bit, she took her backpack off and put her jacket on while muttering, "might need to get some warmer gear while we're here too," and then on her backpack went and she began to turn her attention to the shops until she spied the one she wanted, "This way Jermayan. We've got to get this done and over with in order to buy tickets for the trip." Jermayan listened as she told him the best options for their itinerary. He didn’t have a better plan for it. He looked around the area as they got off the boats. He was lucky that he had very warm clothing. Though he didn’t find it very cold yet, there was a bite in the air. He knew the temperature was going to drop more. He could smell it. There was a lot to do here. He followed her, knowing she would get the best deals for his wares. He figured they would have enough spare change to buy tickets. He would leave it to her at this point. She found the shop she was looking for fairly easily since they were kind of all clumped together. Walking in she smiled at the shop keeper, "Hi! How are you today?" The shopkeeper smiled back, knowing full well how to play this game, "just fine missy, just fine. So what can old Jacob do fer ya, huh?" Again she blasted him with a bright smile. Then she shrugged off her thin jacket, passing it to Jermayan to hold, and tugged out the ivory, making sure to bend over in such a way as to give him a nice view of bare skin beneath the neckline straight down the torso. She too knew how the game was played and with old men like these sometimes it was what they got that meant they'd give a better price. While she was busy the old man's face had changed from cordial to almost goofily blushy (think master roshi) and his eyes were plastered to the skin he could see but hadn't realized she was purposely showing off. She pulled out the ivory and set it down on the counter, "we're lookin to sell this. Now its larger than most you'll get, heavier too. And you could easily break it up into several pieces and make a larger profit off of it then selling it whole." His eyes sharpened, though the blush remained, "ah er, yes, yes it is quite large isn't it. And you are right. I would break it down to sell it easier...," his eyes were greedily staring at the ivory to find any small flaws. Shea noted his expression and stated offhand, "and there isn't even a small crack in this ivory," she also shifted positions enough to where her shirt actually rode up a bit to show off some belly, "its very high quality." The old man choked a bit and nodded, "yes, yes it is. I'll pay you 10 platinum." She laughed and shook her head, "Oh no. This is worth way more than that and you know it," then she leaned over so he could yet again see straight down her shirt, "we won't take less than," she paused a bit as if considering, "a hundred and twenty platinum for it." She was well aware that he knew the real worth of the ivory and that the game was on. He considered, his eyes darting to her gaping shirt collar several times before he countered, "thirty plat." She wriggled her hips and stated back just as quickly, "100 plat." The barter game was on and the old man was losing so badly it was hilarious. At the end they both agreed to 85 platinum total for the ivory and shook hands to seal the deal. The platinum was handed over and the old man had to ask, "dear can you pick up that piece of paper from the floor for me?" Now that paper hadn't been there even seconds before he asked so Shea's eyes narrowed and her smile sweetened, "why sure I can," and then she sauntered over, grinned to Jer, accepted his coat for a minute, which basically covered her entire figure and then some and went over and picked up the paper, "here ya go!" The disappointment on his face was epically comical and she really had to hold her laughter in so hard until they got out the door. There she busted out in stark laughter and handed him his coat back while at the same time taking hers back and shrugging into it. "He still got a good deal but man did I get a better one," she was still laughing pretty heartily even as she moved towards the ticket booth, "we'll easily have these paid for," and shortly thereafter she was leading him towards a food shop, "we'll get some foodstuffs for the trip since it's long and they don't provide sustenance." She darted into the food shop and tugged out some items she herself had made to barter with and was in and out of that shop in less than five minutes with more than she'd expected to get from just those small baked goods so she was pleased. She led the way to the station, tickets in hand, and passed them to the attendant as she climbed into the box hanging from a cable. It was roomy but not overly large and it only allowed two people to be inside so that worked out quite well for the both of them. The seats were long and soft and there were blankets and pillows inside as well. Once they were settled in, the door closed behind them and the car started moving. "Here," she handed him his platinum, "I got a lot better deal on that ivory than even I expected to. If his wife had been at the counter things might have gone differently," she giggled, "fortunately more than likely his wife was out having drinks with the girls or something." Jermayan followed her to the shop and watched as she worked. She was very good at negotiating with shopkeepers. He tried to keep a neutral expression ad ended u scowling most of the time she was flirting and raising the stakes. He coughed when she actually took his coat and put it on briefly. He watched as they shook on it and he counted out the plat for her. As soon as they got outside, he lost his stoic demeanor. He threw back his head and laughed uproariously. He had trouble stopping the laughter. He accepted the money and put it away before following her to the cable cars. He really liked the seating that he could stretch out on and not feel cramped and uncomfortable. Shea busted out laughing as she thought about the bartering as the cable car took off. In the back was a fully functional bathroom so it would really be a nice two or three day trip. "Man, did you ~see~ his ~face~?? Show a little skin with old geezers like that and boom bartering goes much better," she rolled on the long seat she'd picked as she laughed it up, "I'd have still gotten a good deal but there's a good reason I wore this particular shirt," she tugged the collar a bit, accidentally flashing bare flesh in the process, "it's loose enough to give a good sight line all the way down to my stomach but clingy enough that he couldn't get a really good look at the bits he reaaaaaly wanted to see." Still giggling, she sat up and began to empty out the food bags. There were several, all stuffed into a much larger bag she'd purchased while in the store. Above the long couch/beds there were cupboards which she began to fill. Above hers was a long refrigeration unit and the cold storage foods went in there as did the water. "It'll be at least two or three days before we hit the big city and since I also purchased return tickets this car's basically ours for the next two weeks. So it'll get parked until the day we leave. I figured two weeks would be great for being out of the city and we'll still get back in plenty of time." Long windows ran nearly the entire length of the cable car, save for the bathroom which had much smaller windows with built in coverings for privacy, which had drapes set up on a shelf just above the windows that could be pulled down to cover them with no effort what so ever. She stared out at the passing scenery as she put stuff away. Outside as the car began to really move, rustic houses could be easily seen dotted around the country side. The front of the car's window showed an off distance view of mountains and forests, too dense to easily traverse, which was breath taking. Reaching down she cranked the small turn handle and the window opened, letting in bracing fresh air, "better. I like fresh air, ya know?" Having never been here before it was a wonder she knew so much about the cable car, the shop keepers, the village layout. Shaking her head she flopped back down, mirth having made her cheeks pink up nicely and her eyes sparkle brightly, she sighed and let her hair down, "a lot of places are the same I'm finding out. People, village layouts, transportation types. My continent uses these types of cable cars to go from place to place. Usually it only takes a couple hours to get somewhere so there aren't any private cars like here, but it's mostly all the same." She took of her shoes, which were fairly worn out, let them fall to the floor of the car, and then sat cross legged on the seat, "people are the same a lot too. Most men will give a better deal to a woman who knows how to use her assets to her best advantage. The same is true as well. We might not be so lucky next time. The person behind the counter may just be a woman. Which means ~you~ are going to have to learn to barter...and flirt." Her smile grew wicked, "and we have about two or three days to really get you capable of handling shopkeepers. Women are much more...able to see through the game and turn it right back around on you and you're so freaking innocent that you'd fall for it hook, line, and sinker."